Does anyone know anything about LED lights? Here's some photos of the figure I have and the LEDs I'm using. My Figure: The Chest is made up of 3 parts which I unfortunately had to cut to do my custom work. Since the figure talks it's probably a lot more complicated than a simple light up figure. My Custom only needs to light up so I can forget the talking function. 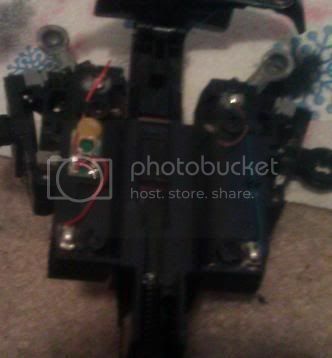 -The Weapon is in the front part of the chest, it has 2 wires, a red and black, it has a light inside. -The Center peice has the button that will cause the eyes to light up when pressed on one side (The Rear of the Figure when together) and the other side has the voice chip. This piece has the neck where the light will be attached. You can also try using the compact LED kits that are used for MG Exia and Gundam 00 Raiser. They are bought separately, and in pairs I believe. Yeah, I have the LED, now I need to figure out how to attach it so it will work. If I may ask, what are you customizing? It's a Leader Class Ironhide. It's mostly just a repaint aside from my swapping out the head entirely and giving him blue LEDs instead of Green ones. 2) They're too big to fit in the head and I have no place to put a button, so only the bulb can go in the head, the rest of the LED kit has to go in the torso where there's a place already for an on/off button. ...if I remember right there are LEDs in Ironhide's head already, why not just replace the LED itself and leave all the wiring intact? all you should need to do is snip and solder. ...that's what I mean. Find a blue LED, use the existing wiring and put the blue one on it. How do I tell which wires take the electricity from the LED to the battery and which ones take the electricity from the battery to the LED? My current setup, nothing is currently connected. I have a white bulb in the chest, a blue one in the head, I have 2 yellow wires from the on/off button, 2 blue wires from the batteries, a green wire from the right side and a red from the left, then I have a red and a black wire coming from the weapon the lights up. any suggestions? With LEDs, I think the polarity does matter (it doesn't for light bulbs). Your best option is just to trace the wires and see which one is positive and which negative based on the way the batteries fit in. Just a note: convention has "current" running from positive to negative, while the actual electrons go the other way (almost certainly won't affect you, but it helps to know just in case).